I love this word! I just wrapped up reading a particular book series written by a wonderful author, & this word was all over this book series. In this series, this word had various meanings, but it mostly conveyed the unspoken feelings of love. The last book in this series truly made my heart melt. I just finished reading it today, & I’m about to go back & read the book all over again (yep, that’s how much I enjoyed the last book). I picked this word to be my favorite word this time around because this particular book series really tugged at my heartstrings, & I’ve been thinking about the storyline lately, letting my imagination & my daydreams to run amok inside my head. 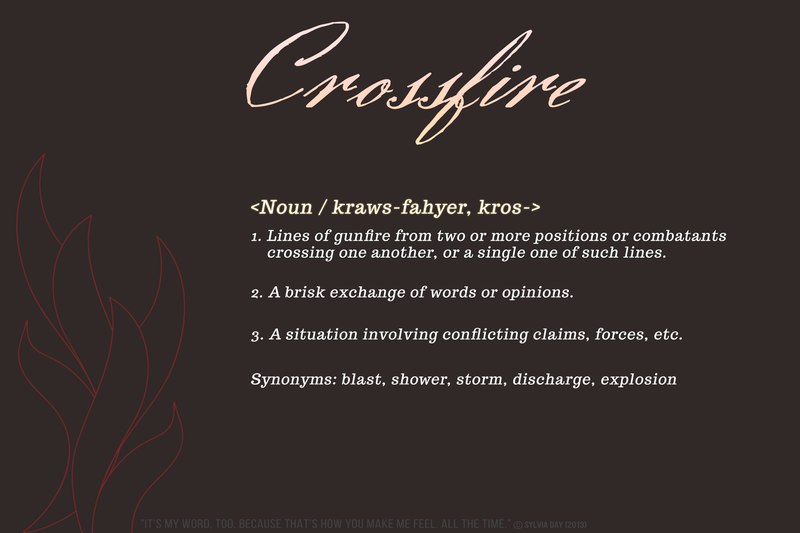 This word, crossfire, really sums up how I feel about the series, just like how the main male character feels about the main female character in this series. Crossfire conveys what I dare not say aloud, yet feel from the inside out. I don’t usually like to chat about the books I read. Most of these books are of a very specific genre that I don’t like to openly talk about, which is my way of saying that I’m too shy to admit that I enjoy reading this specific genre of books (most of which Jian would call “bean flickers”). However, with this particular word that I’ve chosen, I guess I basically just outed myself to the whole world & announced quite obviously that I read books of a certain flowery genre, & while I’m on a roll of announcing things, I will thoroughly admit that I am a fan of this author & her storyline in this particular book series. Therefore, I choose this word. Cheers…no, wait. CROSSFIRE.